Do you pay attention to the styles as they start coming in each season? The 70's are making a huge come back in the fashion world and its now fully visible in the sewing world as well. I've seen it in commercial patterns recently and now its all over PDF indie designers, too. And as I wasn't alive in the 70's, I'm loving it! Its to fun to see it on kids styles and not just adults. Love Notions just released the Prisma Dress, which is so flipping cute I'm having trouble not making ten. I've already made two and am trying to not make any more for now until I finish other projects, but the knife pleats keep calling my name! I kind of feel like I should be sending her off to prep school in this! The Prisma Dress has three different views - A line, dropped waist swing skirt, and dropped waist pleated skirt, and 3 different sleeves lengths - short, elbow and long. 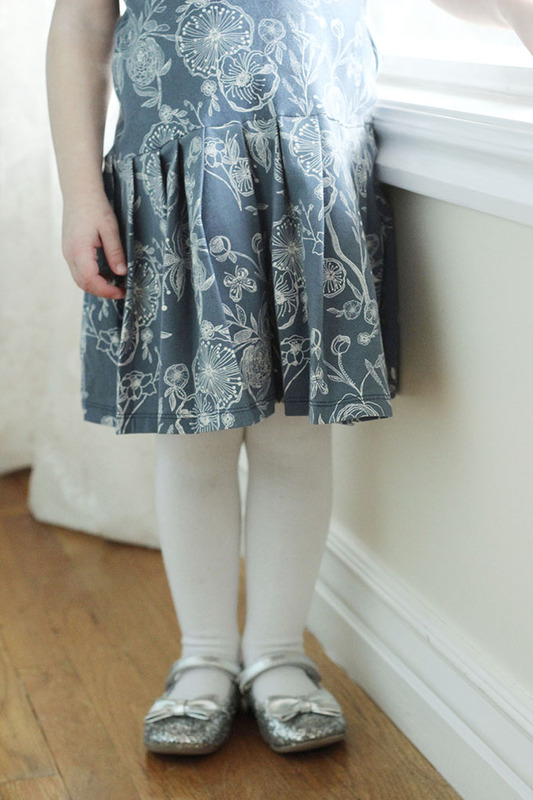 The A line version has optional pockets and the swing skirt has pocket flaps. 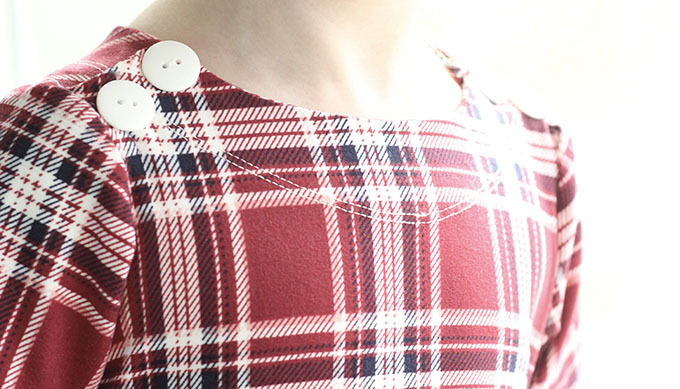 There are also peter pan collar and boat neck options! At first glance this may seem like just a little girls pattern, but older kids up to size 16 are looking amazing in it, too. A couple testers made the a-line options for their tweens/teens and its looks so good! I did boatneck, dropped waist pleated skirt with short sleeves and I think its perfect. 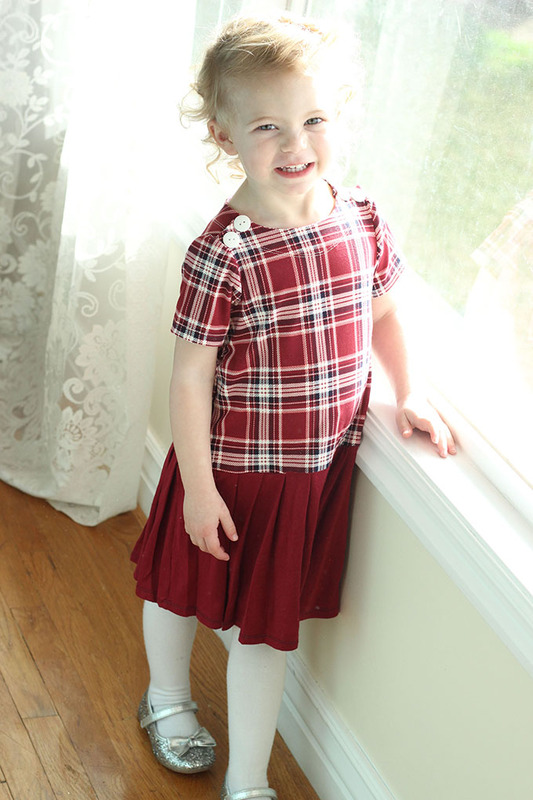 I used plaid brushed poly from So Sew English and burgundy rayon spandex for the skirt from Raspberry Creek Fabrics. The pleats give this a perfect prep-school-meets-femininity and like I said, I am in love. I just had to pair the pattern with plaid. And you all know my Art Gallery addiction, so I had to make the blue floral one as well, with Art Gallery cotton lycra from Raspberry Creek Fabrics. The pattern is on sale now for $7 so be sure to head over to Love Notions and get sewing, and I'll go start sewing some solid colored knee high socks so go with all her Prisma dresses! Thanks for helping with testing Tiahna! Your dresses turned out so cute, but not nearly as cute as your daughter!